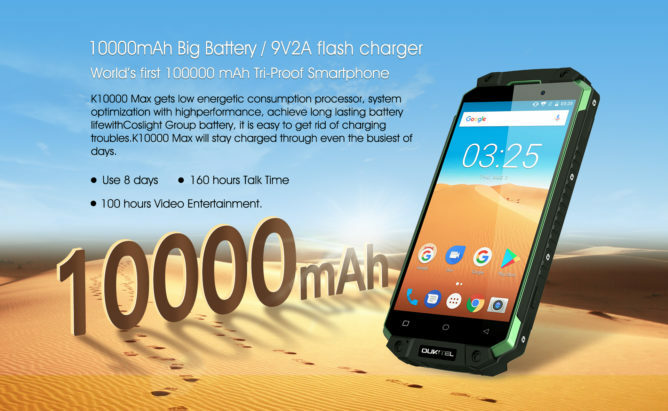 The headlining feature in OUKITEL's latest flagship is the huge 10,000mAh battery, provided by the battery supplier COSLIGHT group (whose products power phones by Huawei, ZTE, and others). With the power-efficient MediaTek MT6753 under the hood, you can expect up to 8 days of battery life and 160 hours of talk time. It might not last you the entire duration of the A.T., but it should see you through most trips. And if your ramblings take you across service areas, the dual-sim dual-standby functionality allows you to maximize your coverage with a minimum of fuss while you get wherever you're going. It's not just about the destination, though. It's the journey that matters. And with the 16MP Samsung-manufactured rear camera, you'll be able to document all that rugged beauty. Thanks to the IP68 rating, you can even snap pictures in the rain or underwater, and you won't have to worry about keeping your camera dry. We aren't all Ansel Adams, but with the K10000 MAX, you can certainly try. You can also expect all the necessary basics like Fast Charge at 9V 2A, a rear fingerprint sensor, 3GB RAM, and 32GB storage. All that sounds great on paper, but any outdoorsman knows the real experience can't be so easily documented. It's the small things that end up making a difference. 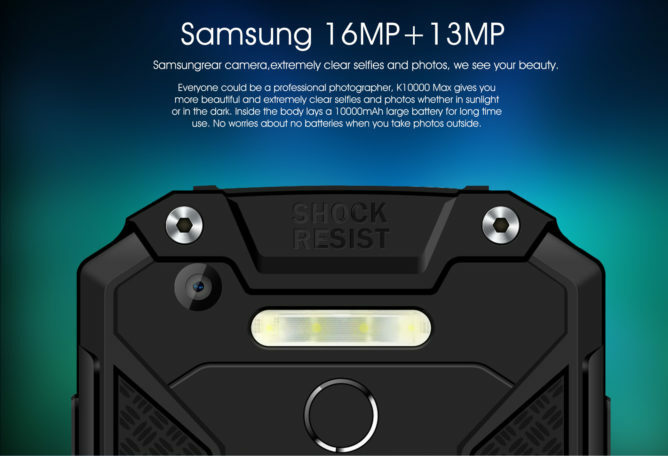 Things like the super-bright rear LED array that can illuminate your campsite at night, or the flat and balanced sides that allow you to set the phone down in multiple stable configurations to line up the perfect shot, and a durable build quality that can survive some of the harshest abuse on the trail. And, of course, the K10000 MAX ships with Android 7.0 Nougat, so you don't have to sacrifice software in your love for the outdoors. Getting in touch with nature doesn't have to mean giving up all the comforts of modern technology. You won't even have to compromise on price, as the K10000 MAX is just $249.99. Want the best deal? Right now you can subscribe for more news about the K10000 MAX and get a $50 coupon towards your purchase. Even better, one out of every 50 subscribers will even get a coupon for half off. That's just $124.99. At these prices, your hiking boots might have cost more than your phone. Who knows, though. With the IP68 rating and the 10,000mAh battery, the K10000 MAX might last longer than they do.